What an honor! 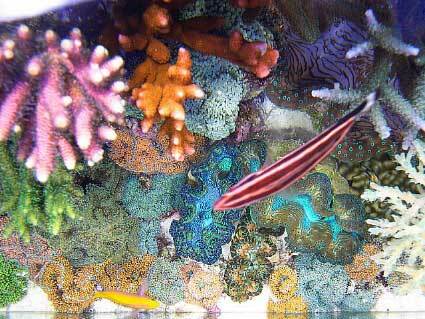 What more can I say in response to being featured as "Tank of the Month" in Reefkeeping Magazine and Reef Central, among some of the most beautiful reef aquariums in the world? Having started in this hobby long before the boom of the World Wide Web, I unfortunately learned many things "the hard way" through misguided firsthand experience. 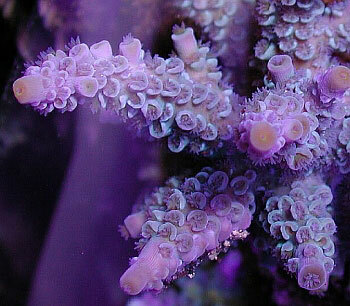 Fortunately, today there is Reefkeeping Magazine and the Reef Central community and forums, which contain everything and more any reefkeeper would ever need to know. 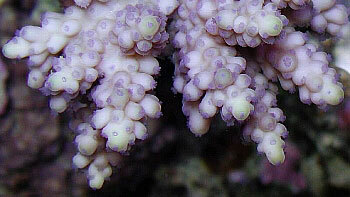 Without these resources, this aquarium would not be what it is today. Although I was born in Brooklyn, New York, I grew up on a small lake in the woods of northern New Jersey. Our house was one of about twenty or so that were located on a small island, so my upbringing was centered on water, from fishing and water skiing in the summer to ice hockey in the winter. Though growing up on the lake sparked my innate passion for underwater life, I quickly became consumed by the spectacular array of species brought in from around the world to our local aquarium shops. After what seemed like forever in the freshwater hobby, I was finally able to convince my parents to allow me to "go salt" about 15 years ago when I was in middle school. My interests deepened with that original 55-gallon tank, and my mother began dropping me off at the local fish stores while she did her shopping. I obtained permission to get a job and began to "work" at one of these stores, yet to me the job was merely fun I got paid for having. I seldom saved paychecks, though, and my arsenal grew to three 55-gallon tanks and one "telephone booth," as my mother called it; a six-foot long, 180-gallon tank paid for by bagging thousands of fish at the store. College came, and while many buddies were parting with high school sweethearts, I began parting with my sweethearts of the underwater kind. Two years after leaving college I was married, and we settled into a one-bedroom apartment in northern Virginia. Knowing we would soon be looking for a new house, I decided to set up a 10-gallon "nanoreef" in, of all places, the kitchen! 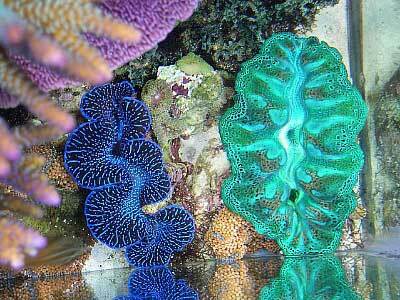 It was complete with a concealed refugium in the cabinet, tridacnid clams and SPS corals. I was a victim of its success, and it was evident that I'd soon need to upgrade, without having to bring in the old "telephone booth" aquarium that was waiting in my father's garage. Last year we finally purchased our first house, in a pre-construction phase that would not be ready until late 2004/early 2005. With that in mind, I decided to upgrade to a new tank, limiting myself to a tank only three feet in length, as it would soon have to be moved. I decided on the current 65-gallon that is featured here. 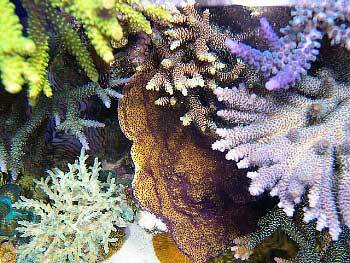 I have always been a proponent of keeping a natural-looking, clean reef, and for that reason designed a small 20-gallon tank that would house coral fragments which otherwise would have hindered the beauty of the main display. A few months after this, I added the 54-gallon bowfront corner tank, which is seen in the apartment photo, to separate most of the soft and LPS corals from my SPS display. With the foundation being laid on the new house as I write this, soon all of this aquarium's inhabitants will move to the new house and be placed into the 180-gallon purchased during my high school years. This cannot come too soon, as you can see that this tank, too, has many inhabitants that will benefit from tripling their real estate. This will not be their final destination, however, as I have already designed a custom room into the new house for my dream tank which will be on the order of 500 gallons. The "search function" will be my friend at Reef Central as that future tank becomes a reality within the next couple of years. I decided on an AGA reef-ready 65-gallon (36"x 18"x 24"), although in retrospect I would have liked a tank at least 24" wide. As I designed the system with a 20-gallon frag tank built in, I realized that I was going to have to make the stands and hoods myself if everything was to fit together perfectly while looking slick enough to have in our living and dining space. After years of hunched-over enjoyment peering into friend's tanks I've always preferred aquariums that sat higher than they would on most production stands. 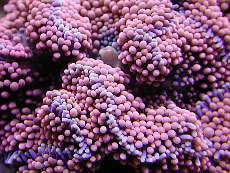 The frag tank would sit lower for convenience and simplicity. I originally planned on making the stand 36" high, but after designing how everything would fit, 40" became a necessity. It took longer than expected, but after about eight weekends in my father's basement the project was complete and I was more than happy with the results. 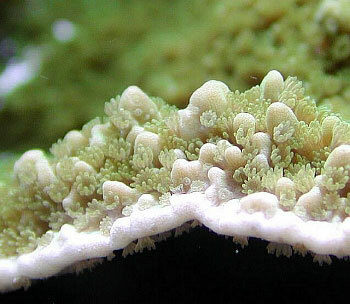 Unfortunately, aquascaping is all too often the most overlooked aspect of this hobby. People concentrate on things such as lighting, calcium, and which salt to use, while forgetting that this hobby is an art form with Mother Nature as our Picasso. Happily, this is one problem in the hobby that doesn't require a lot of money to fix. I've always tried to make my small glass box look much larger than it really is, which was less of a challenge on the 65-gallon than it was in the 10-gallon nanoreef. It's amazing the amount of time and work we put into achieving something that Mother Nature does so effortlessly. I always start my tanks with the largest live rock pieces I can find. No matter how you stack a pile of apples it's still just a pile of apples, but with some large and irregular pieces of live rock, rotating even one piece only a few degrees will change the entire landscape. I did the best I could to create depth in the 18" width of this aquarium, but I look forward to the 24" the 180 offers, and around double that dimension in the upcoming ~500 gallon tank. I covered the bottom with a small amount of Southdown sand, and completed the eventual reef structure with just over 100 pounds of mixed Pacific live rock. 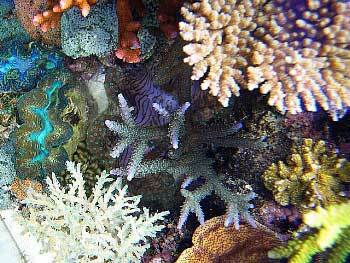 I built the rocks up with a valley in the center, although that gap is being filled exponentially faster each day by the reef-building SPS corals that dominate the upper parts of the reef. 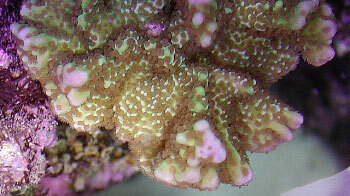 The sand layer is now completely covered by Ricordea and Tridacna clams. The 65-gallon display tank is a standard AGA reef-ready setup, with one overflow drilled to handle one 1" bulkhead and one ¾" bulkhead. I decided to use both of these as drains to maximize the amount of circulation through the sump. I used a Stockman type drainpipe to keep things quiet inside the overflow. The 1" drain goes straight to the sump, while the ¾" goes to a small refugium of about seven gallons before draining into the sump. 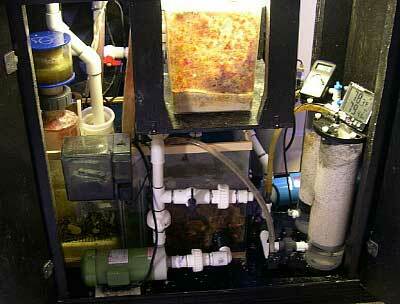 The 20-gallon "high" frag tank also drains into the sump through a 1" bulkhead drilled into the back of the tank. The circulation for the entire system is provided by two Gen-X MAK4 external pumps that each generate 1200 gph at 0' head. To keep things simple, I decided to use just one return pump from the sump to provide a return for both the display and the frag tank, while providing more flow to the display via a closed loop. 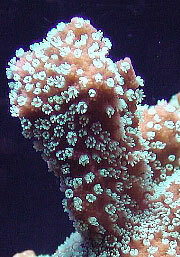 Alternating flow is important at such high volumes, especially in a smaller than average SPS system. I decided to utilize two well-known devices that accomplish this goal: the Switching Current Water Director (SCWD) and the Sea-Swirl. The first MAK4 is fed from the 20-gallon sump and 'tees' off to the frag tank and the display. 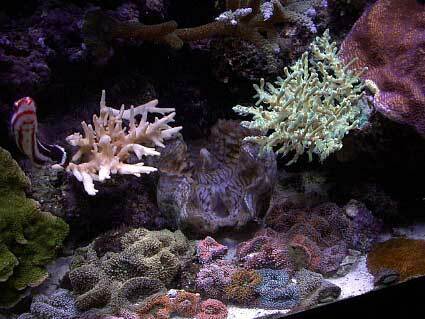 The display side discharges to a ¾" Sea-Swirl in the center of the tank. 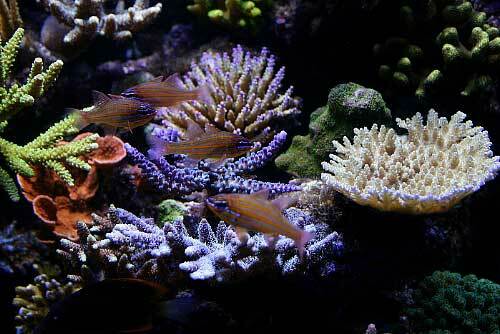 The frag tank side goes through a SCWD that alternates through each side of the 20-gallon. Ball valves are located throughout the plumbing so that I can regulate how much flow each outlet receives. The remaining MAK4 feeds from a 1" intake drilled into the back of the 65-gallon and goes through a second SCWD that 'tees' off to either side of the 65-gallon display. The constant switching of both the SCWD and the Sea-Swirl operating independently of one another provides very chaotic water movement, never allowing any stagnant areas in the tank for long. 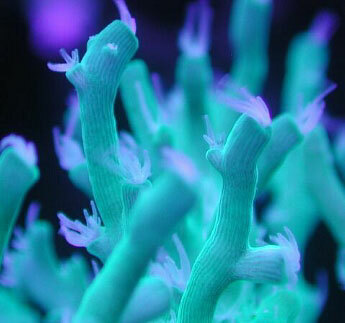 Many reefkeepers who have seen my system comment on its high amount of flow, and I've also noticed that many of my SPS corals grow thicker branches than normal as a result of the increased flow in comparison to other systems. While this may sound a bit complicated, the general theme is lots of flow provided in the most chaotic way possible. 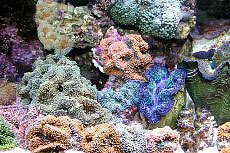 Biological filtration consists of just over 100 pounds of mixed Pacific live rock, along with a shallow bed of Southdown sand. A small seven gallon refugium that contains various species of macroalgae is plumbed into the system, and it's lit 24 hours a day by three 15 watt NO fluorescent lights. Mechanical filtration is accomplished on two fronts. 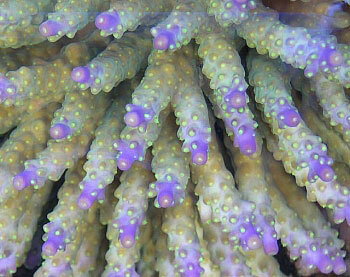 The first is a EuroReef ES5-3 protein skimmer that does an incredible job. This is by far the most problem-free skimmer I've ever dealt with. I plugged it in right out of the box and the only tinkering required was raising or lowering the riser pipe according to how much skimming is desired. In addition to the protein skimmer, I use a 100 micron filter sock on the 1" drain from the display tank that helps pull out detritus before it has a chance to break down into more noxious compounds. I am a big proponent of using carbon as a means of chemical filtration. I run one cup of Marineland Black Diamond carbon in a small power filter in the sump that is changed about once every two weeks. While its benefits are arguable, nobody can deny the clarity it gives to the water, making the water so clear it appears as if the fish are suspended in air. With such a high bioload I do have some nuisance algae growth, but I decided to just deal with that instead risking the using of any phosphate-removing media. 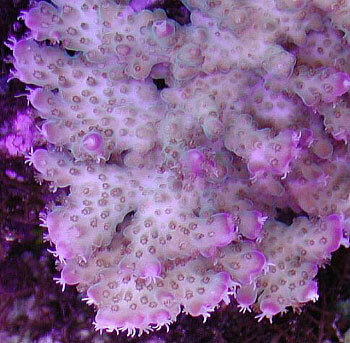 As the pictures can attest, I've had no problems with coloration of the corals. Maintenance of the system is minimal. I do 15-gallon water changes every two weeks, and change the micron filter sock as needed which usually works out to about twice a week. The collection cup of the skimmer is emptied and cleaned a couple of times a week also. 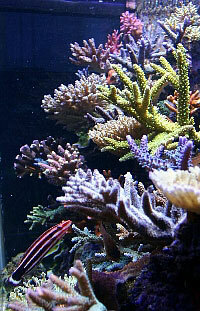 I try to keep the glass as spotless as possible and free of algae, as this really adds to the aesthetic look of the aquarium by focusing the eyes on the reef as opposed to the glass tank. This system has been my first experience with double-ended metal halide bulbs, and I've been very impressed. 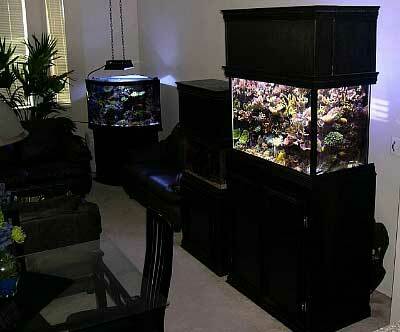 The pendants concentrate and direct more of the light into the aquarium than do most single-ended reflectors. On top of that, their compact size allowed me to fit two of these in the tank's 36" x 18" footprint along with three actinic VHO bulbs, resulting in a total of almost 800 watts on the display. I originally intended to use four VHO bulbs, but space would not allow this configuration within the hood. 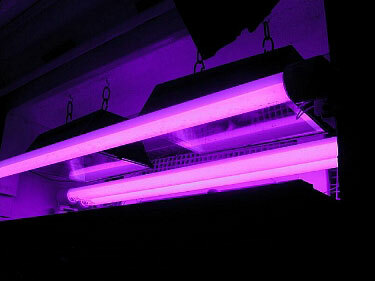 2 x 250 watt double-ended Ushio 10K metal halide bulbs in Reef Optix III reflectors driven by Ice Cap e-ballasts. 3 x 95 watt VHO URI actinic bulbs driven by an Ice Cap 660 ballast. 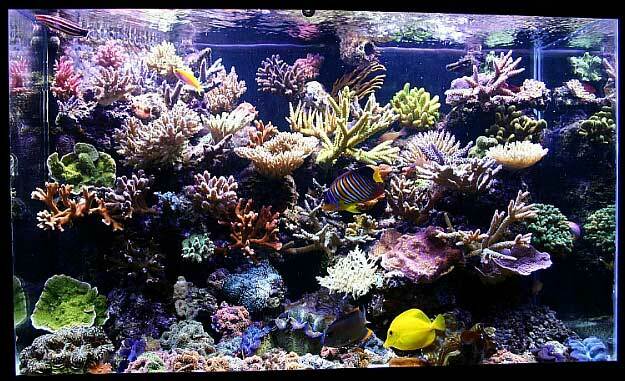 1 x 250 watt double-ended Ushio 10K metal halide bulb in a Reef Optix III reflector driven by an Ice Cap e-ballast. 2 x 15 watt NO Coralife actinic bulbs in standard "under cabinet" fixtures. We all know that one of the toughest and most hotly-debated decisions is bulb choice. My general lighting views have always been to "bake" the tank with intense 10K light while adding more actinic light than the average reefkeeper uses, to give the tank an appearance of what I consider to be on the blue side of white. The powerful 10K double-ended metal halide bulb provides impressive growth while the strong actinic supplementation brings out the colorful pigments similar to that seen when using 20K bulbs. In addition to this, I have always enjoyed the electrifying glow provided when just the actinic lights are on in the morning and at night. I use the same lighting system with a 20K un-supplemented bulb on the corner system, and while I like the color, the intensity of the bulb is noticeably less than the10K bulb. 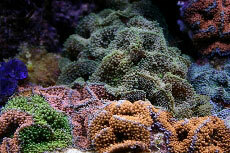 I run the lighting on the 20-gallon frag tank overnight opposite that of the display tank. This has numerous benefits, including stabilization of pH fluctuations and, more importantly, the ability to run this small system without a chiller despite having over 1000 watts of light over about 100 gallons total system volume. Two 4" computer fans mounted in the back of the canopy keep the tank temperature below 81 degrees. Additionally, this focuses the attention on the display tank during the day, as I do not have the luxury of hiding this behind the scenes in our small apartment. 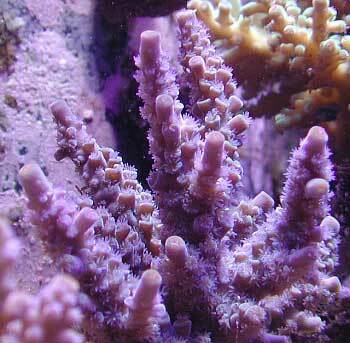 With such a high number of reef building corals in this small volume of water, the first method I use for replenishing calcium and alkalinity is a My Reef Creations CR-2 dual chamber calcium reactor filled with ARM media. As the corals and clams grew the calcium and alkalinity demand was increasing exponentially, and as I turned up the reactor, the pH of the entire system was dropping continuously as expected. In order to help the calcium reactor to keep these levels up, I hooked my auto topoff system to a custom Nilsen reactor built by Geofloors. This device has the additional benefit of raising the overall pH of the system by adding saturated kalkwasser with a pH around 12. Despite using the Nilsen reactor, the pH of the system runs on the low side, but I've seen no ill effects so I don't worry about it too much. The auto topoff reservoir is just about five gallons, so that if the float switch ever malfunctions, the sump can handle the extra water put into the system and the resulting drop in salinity would be minor. In addition to these two devices, I occasionally dose the two-part additive B-Ionic in order to boost low levels in the short term without having to tweak the calcium reactor settings. 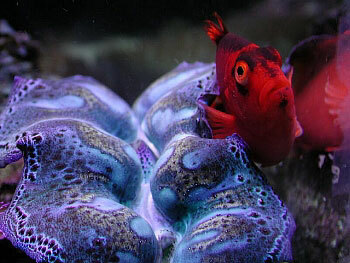 Feeding in this system centers on my Red Sea regal angel that is about as spoiled as a fish can be. 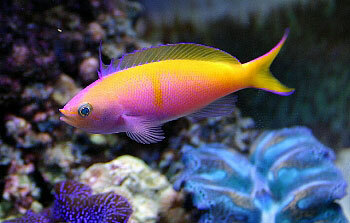 I am lucky enough that all the fish in this aquarium eat Spectrum pellet foods, including the anthias and regal angel. I feed as often as possible, which works out to just two or three times a day during the week and around five times a day on weekends. I offer all foods in a turkey baster, concentrating on keeping the regal angel fat while letting the others get what the regal misses. I developed this method after finding that although the regal angel fed well, it was a much slower eater than the other inhabitants, including the group of cardinals that are relentless in their pursuit of food. I feed Spectrum pellets about half the time, after soaking them in tank water for at least 10 minutes to soften them up. The remainder of the feedings are reserved for a variety of frozen foods. I have come to love some of the gel-based cubed foods, as they deliver more of the food to the fish and less to the aquarium. Many frozen preparations that are not bound by this gel simply disintegrate with so much flow in the tank, never to be seen or eaten by the fish. I use many of these gel bound preparations, including those made with sponges for angels, and those made with lots of vegetable matter. I also use good old mysis shrimp and plankton. The regal angel gets noticeably excited when I feed it squid, so I always make it a point to do so once in a while. On top of all these I throw in most anything I can find that's new or different, because variety can never be a bad thing. 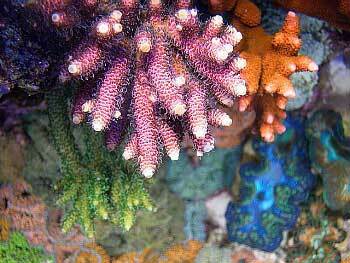 Long ago I stopped feeding phytoplankton and anything geared towards feeding the corals, and have noticed no difference in coral health. While those foods may be beneficial, they are unnecessary. Exporting from the aquarium what you put in is a balancing act, and adding unnecessary foods only makes it more difficult. 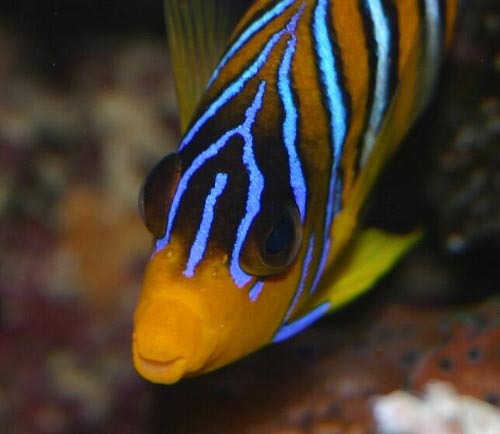 The beauty of saltwater fishes is what originally brought me into the saltwater hobby, and while I have long since moved on to reef tanks, my love for these stunning creations of nature endures. After being in the hobby for so long, most of my fish can be considered not so common, yet not so expensive. Regal Angelfish (Pygoplites diacanthus) - This fish is truly my pride and joy, and is the centerpiece fish of this system. Every time these fish would come in directly from the Red Sea to the local retailer/wholesaler I would attempt to feed them, with most showing little or no interest in prepared foods. 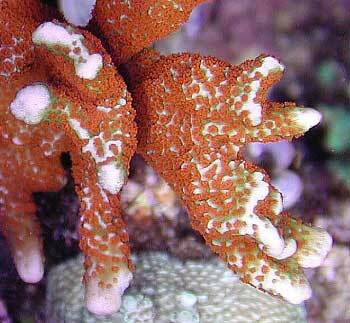 This notable specimen fed like no other I'd seen, and was a beauty among beauties in the group he was shipped with. 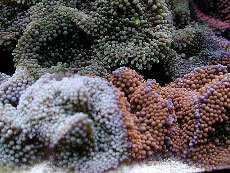 I had already prepared this system by moving all of my zoanthids to a separate tank. 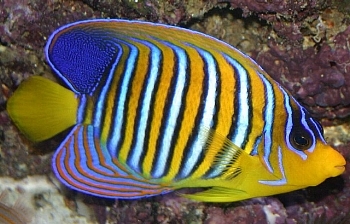 While each individual angelfish has its own tendencies, regal angels are particularly known for their love of zoanthids. 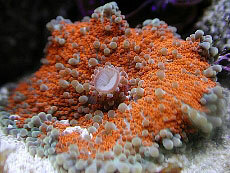 Sure enough, within hours of adding this beauty to the tank he had hunted down every remaining zoanthid, yet to this day continues to leave everything else in the tank alone. I've had him now for over six months and, knock on wood, he's staying plump and happy, eating straight from a turkey baster like the spoiled baby that he is. 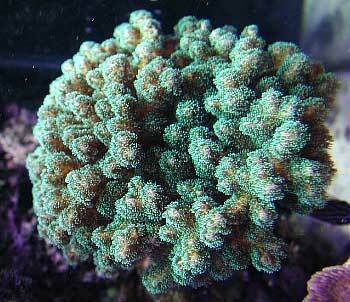 With this said, this species should without a doubt be left to only those aquarists who can satisfy its needs. Yellow-lined cardinalfish (7) (Apogon cyanosoma) - Cardinalfish are perhaps the most overlooked family of fish in this hobby. They are small enough that we are able to witness their natural behaviors and social structure in our diminutive glass boxes. 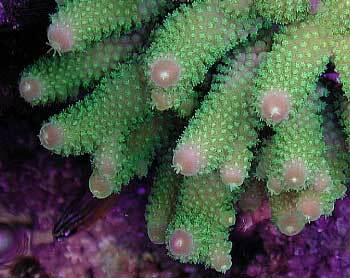 These guys attack food like little tuna and really add life to the tank. Mine have grown up together and now have an interesting hierarchy of dominance, and breed on a regular basis. When I have the room in the new house it will be interesting to make some attempts at raising the young. 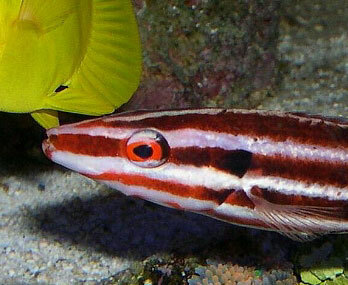 Peppermint hogfish (Bodianus sp.) 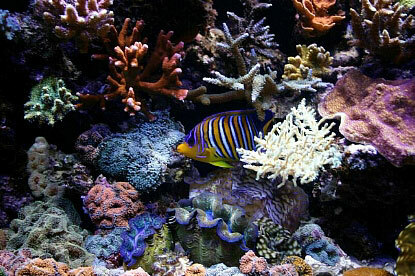 - This fish was originally very rare in the trade and thus very expensive. I purchased Mickey, as he is known, last year as the first fish in the tank and got him for a price I couldn't pass up. He is constantly on the prowl for food, and is one of those fish that appears very intelligent as he scans the rockwork for potential prey. 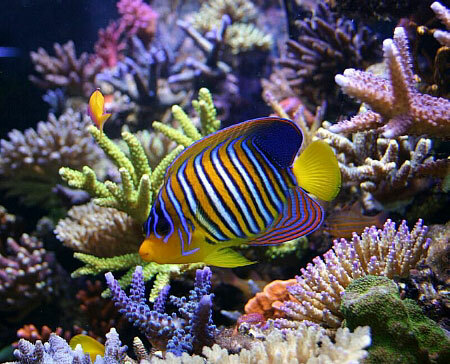 Aside from attacking other wrasses in his tank, he's generally been peaceful. Bartlett's anthias (pair) (Pseudanthias bartlettorum) - In my eyes no fish is more indicative of a living coral reef than anthias. I chose Bartlett's because they adapt well to captivity, stay small, and are gorgeous! There's really no reason to choose a species that does not adapt well when there are so many beautiful species that settle into captivity quite nicely. I look forward to adding to the number of females when the 180-gallon system goes up. 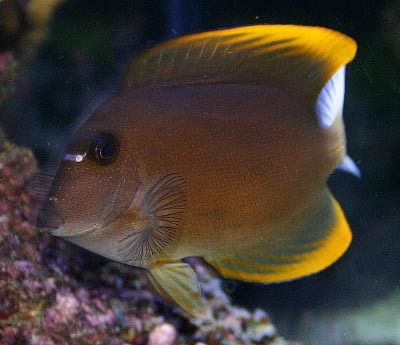 Bristletooth tomini tang (Ctenochaetus tominiensis) - It's nice to find a beautiful tang that you don't often see for a price that won't have you sleeping on the couch for a month! 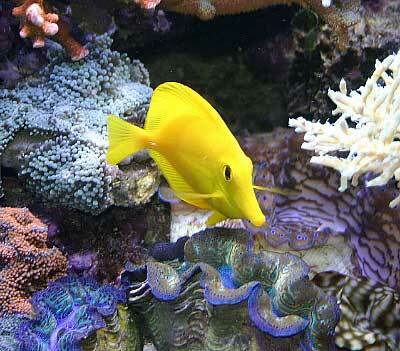 On top of that he's a bristletooth tang and is constantly "kissing" the live rock keeping it free of algae. Basically, he's a kole tang with a fire lit behind him! Yellow tang (Zebrasoma flavescens) - A reefkeeper could have tens of thousands of dollars of livestock in a reef tank, yet most non-reefkeepers would still notice the yellow tang before anything else. I don't care how common they are, they have always been one of the most striking fish in the hobby and continue to keep my interest. 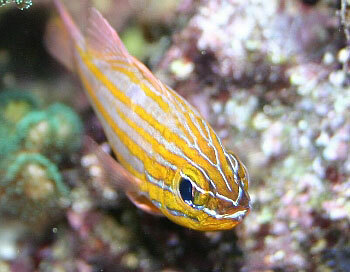 Flame hawk (Neocirrhitus armatus) - My wife's favorite fish and a perennial favorite in the hobby. These guys have arguably the most character of any fish in the trade, with their eyes always moving around with the constant thought, "Can I eat that?" White tiger goby (Priolepis nocturna) - This striking and very rare goby is, without a doubt, the most secretive fish I have ever known. I added him to the tank and thought he was dead after not seeing him for weeks, until I found him hiding in the rockwork perched upside down. He is occasionally seen as a "white flash" for a split second when feeding, but that's about it. Usually, with a flashlight I can find him now, as I know his usual perches. It's a good thing I took photos of him when he was first purchased, for now it's nearly impossible. 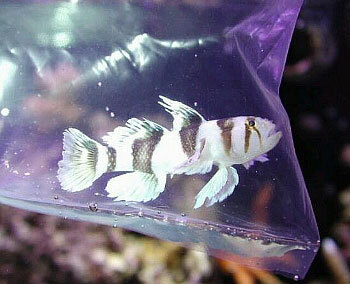 His body and fins are a bright white that reminds me of that seen on clownfish. 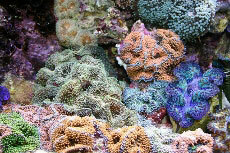 The aquarium is dominated quite obviously by SPS corals at the upper portions of the reef, while the sandbed is dedicated to my Ricordea and clam collection. 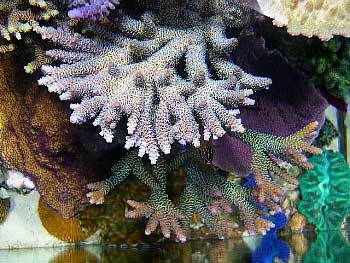 I have two LPS plate corals that also occupy the sandbed, and one non-photosynthetic Diodogorgia sp. 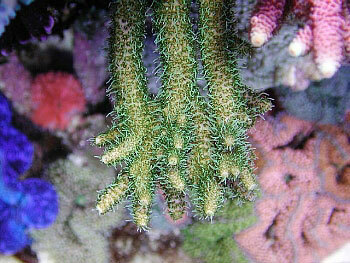 gorgonian occupying the shaded real estate directly under the Sea-Swirl. 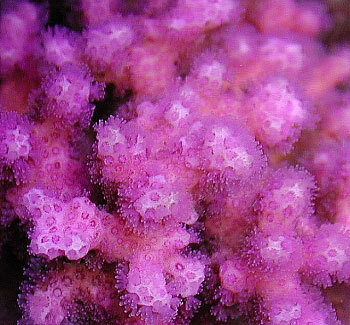 Most of the SPS corals currently in the tank were started as fragments over the past couple of years, and the enjoyment of witnessing them grow is truly special and gratifying. 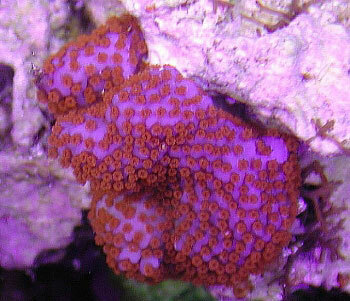 Additionally, I have some wild and some aquacultured colonies. 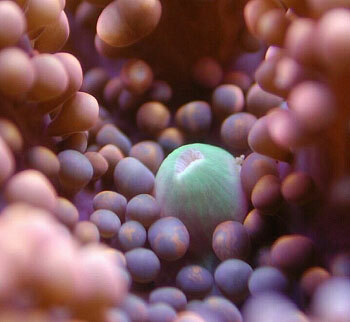 The excitement of bringing home a unique coral that could turn most any color is worth the risk of possibly losing the sometimes delicate colonies. I have 11 Tridacna clams in the system consisting of all five of the major ornamental species, namely five T. maxima, three T. crocea, one T. squamosa, one T. derasa, and finally one T. gigas. All of these clams will soon need the space of the 180, and the T. gigas will hopefully live to see the 500-gallon where it will have all the real estate it needs for a long time. I am also a Ricordea fanatic and am always amazed by the almost complete representation of the rainbow that these mushrooms show in their near-perfect circular "pillows" dotted throughout their discs. 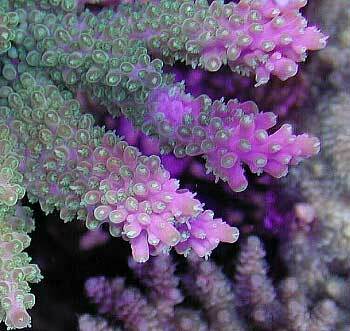 They are a perfect compliment to SPS corals, in my opinion, and I was very happy to see that my regal angel showed them no interest.